If a state passes all the National Association of Insurance Commissioners (NAIC) model acts and otherwise passes the periodic examination of an insurance department’s policies, commercial insurers domiciled there will be acceptable security in other States. An analysis intended to project ultimate loss costs using probability theory and other methods of statistical analysis. Used to determine the adequacy of a property and casualty insurer’s statutory loss reserves and a life insurer’s unearned premium (technical) reserves. May be the basis of rate development. A company licensed or authorized to do business in the state or country in which the company is authorized to sell insurance in. Individuals working for an insurer or an independent contractor selling insurance. Must be licensed in all states where the insurance is written. The greatest amount recoverable under a policy or reinsurance agreement from all losses or a single loss incurred during the life of the contract. Reinsurance purchased for excess of an aggregate loss limit. Aggregate stop loss protection caps the annual aggregate loss. A method of financing risk outside of the commercial insurance regulatory system. This method is typically for the primitive buyer. 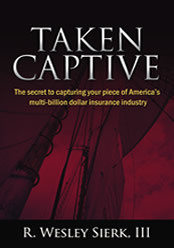 A captive insurer having more than two owners, typically members of an industry trade association. Sometimes the association itself is the owner of the captive. The point at which the excess insurer or reinsurer starts paying losses on specific or aggregate stop loss basis. A conciliator who represents the insured when purchasing insurance or reinsurance. Therefore, the broker’s compensation should be from the insured, not the insurer, to preclude conflict of interest. A closely held insurance company whose insurance business is mostly supplied by and controlled by its owners, and wherein the original insureds are the principal beneficiaries. A captive insurance company’s insureds have express involvement and power over the company’s major operations, including underwriting, claims management policy and investment. A sponsored captive or rent-a-captive, which maintains underwriting accounts separately for each member. The amount of first-dollar loss that the insured retains, on either a per occurrence (specific) or annual aggregate basis, before the primary layer of insurance coverage responds. Federal governmental body with supervision over employment-related issues including employee benefits covered under the Employee Retirement Income Security Act (ERISA). A policy that insures against perils included in a special risk policy or supplements coverage’s in a named perils policy. Often used to provide flood and earthquake coverage. An approach for indentifying, controlling and financing of all sources of risk within an organization in a corresponding manner; an effort to provide insurance solutions to business risks not traditionally insured under property and casualty policies. Coverage provided above the major policy’s limit or the insured’s self-insured retention (SIR); typically provides coverage similar to the primary layer. The dollar addition point for the reinsurer. Particular perils and exposures indentified as not being covered under a specific policy. Insurance against losses arising from the bankruptcy of the insured. The insurer guarantees the performance of the insured, e.g., for debt repayment. An insurer that issues a policy and reinsures all or a significant part of the risk to another insurer. Uniform accounting method of actions and concepts developed by general consensus of the accounting profession, to support in the preparation of various financial statements. Developed by the Financial Accounting Standards Board (FASB). A captive insurance company with more than one owner. See also association captive. A hard market occurs when insurance premiums increases and capacity decreases. In a hard market, insurance companies are less flexible on coverage’s, terms and rates the policy period. Typically used in liability polices. Losses that have occurred but have not been reported to the insurer as of a particular date, sometimes referred to as “pure IBNR.” The definition of IBNR is often expanded to include future development on case reserves and loss on reopened claims, sometimes referred to as RBNE (reserved but not enough).The amount of IBNR is typically estimated by a casualty actuary. Losses that occur within a given time period, adjusted or not or paid during that period. Excludes IBNR. INSURANCE SERVICES OFFICE (ISO), Inc.
An organization that files rates and forms for its member insurance companies. Insurance companies go to ISO to gain access to forms, exclusions, endorsements, etc. Non-members may also purchase forms for their use. A financial promise issued by a bank that ensures funds will be available if requested. For captives, LOC’s (1) can be used in place of or in addition to cash or other capital, and (2) to securitize the fronting insurer’s reinsurance created by the captive. Losses with claim sizes of specific occurrences limited to a particular value; for example $750,000. Fluctuations in insurance and reinsurance rates and surplus capacity. Legislation drafted by the National Association of Insurance Commissioners (NAIC) to become a standard for agreement by states. An individual or organization that owns and applies for an insurance policy, pays the premium, and is responsible for policy compliance. A policy issued particularly listing the perils insured against. Compare in the direction of special risks. The NAIC’s Model Acts suggest or require that states become accredited. This can often be the cause of concern to captive owners. An Owned company whose financial results are not consolidated with any of its shareholders, nor are the shareholders allocated any portion of the company’s income for tax purposes. Income tax deferral is created if the NCFC is located in a jurisdiction that does not have an income tax. In other words no tax is due until such time as income is repatriated to its owners. A policy covering claims that arise out of an event which took place during the policy period, regardless of when a claim is made. In order for coverage to be provided, the incident creating a claim needs to occur within the policy period. It is not necessary for the claim to be reported during the insurers underwriting different types of liability risks to avoid ungainly multi-state licensing statutes. Must be owned by insureds. A support attachment to commercial general liability insurance purchased by the owner of a business with premium paid by the owner. Typically covers contractors and subcontractors. Amount of incurred losses paid out by the insurer. An IRS (Internal Revenue Service) regulation ruling how a specific transaction will be taxed. A Department of Labor (DOL) ruling in which a transaction is allowable under Employee Retirement Income Security Act (ERISA) regulations. This is required for pure captives insuring shareholders’ employee benefit risks. Excess damage compensation awarded to the plaintiff for a los. Anticipated to succor the plaintiff for mental anguish or to make a case in point of the defendant. Usually not included in policy limits. An employer who meets state financial and size norm and approved to self-insure workers compensation. Every state in the US has its own retention limits, filing and security requirements. A quantitative measure used to determine how much a given policy should cost, calculated using historical data to determine the risk of future claims. Protects against loss in which individuals or entities agree to indemnify each other against specified kinds of losses via a mutual exchange or insurance contracts. An unincorporated group facilitating an exchange of insurance contracts, managed by an attorney-in-fact. Equivalent to the insurance company in a stock or mutual format. An insurance company’s ability to protect itself against the risk of losses with other insurance companies. Individuals and corporations obtain insurance policies to provide protection fro various risks. The recognition of risk, risk assessment, developing strategies to manage it and mitigation of risk using managerial resources. Strategies include transferring risk to another party, avoiding the risk, reducing the negative effect of the risk and accepting some or all of the consequences of a particular risk. Distinctive insured’s concurrently purchasing liability insurance pursuant to the terms of the federal Risk Retention Act of 1986. An owner controlled insurance company authorized by the Federal Liability Risk Retention Act of 1986. A captive with one shareholder, also known as “pure captive.” There are more known single parent captives than are group-owned captives. The process of retaining risk through the maintenance of internal reserves. Amount of losses incurred under self-insurance before the excess insurance attachment point. Independent adjusters for primary casualty and liability claims. Usually hired by the Insured or the captive reinsurer. Cost associated with the decision by an insurer to accept or decline a risk; including but not limited to meetings with insureds or brokers, actuarial review of loss history, or physical inspections of exposures. The insurers profit before investment income and income taxes. Involves the procurement of certain insurance policies protecting both the owner and most contractors involved with a construction project. Also called a controlled insurance.